Matched Free Bet up to £25. Deposit & Bet £10 on any sport. Min odds of 1/2 to qualify. Netbet have come a long way since opening their service in 2001. The bookmaker is more commonly known in English and French lingual areas but is now spreading its wings to the rest of Europe. 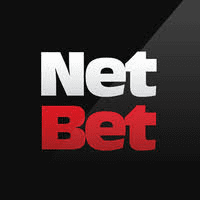 Netbet offer a range of betting opportunities in Sports, Casino, Bingo, Poker and much more. There are many reasons to create an account with this bookmaker, the odds are highly competitive, there are vast markets available to customers and the customer service is of a very high standard. What’s more, they have loads of offers available to new customers! One of the highlights of the bookmaker is its welcome offer on first deposit, which is 100% of the deposit up to a value of £25. To qualify for this offer place a bet at odds of at least 1.5 on the many sports they offer including Football, Horse racing, MMA and e-sports. More than 5000 markets are open to customers every weekend. The minimum bet you must place for this offer is £10 and you will not qualify for the offer if this deposit was made by NETELLER, Paypal or Skrill. There is no bonus code required when registering for this offer. Whilst the welcome package at NetBet Casino is somewhat more complexed it is extremely generous. Firstly you will receive a 200% welcome bonus up to £200 based on your first deposit. In addition you will also receive 10 free spins on Vegas games. Please ensure you use bonus code NBWELCOME when signing up. The ten free spins will automatically be credited to your account and these can be found under the Vegas section of the site. The £200 bonus is valid on the Casino tab. The casino bonus must be wagered x30 before it is converted into cash funds. The free spins must be wagered x50 exclusively on selected slots that Free Spins have been available on. Free Spins may be used on: Age of the Gods, Age of the Gods – Fate Sisters, Age of the Gods – Furious Four, Age of the Gods – Goddess of Wisdom, Age of the Gods – King of Olympus and Age of the Gods – Prince of Olympus, Age of the Gods – God of Storm. New players. £10+ deposit, no e-wallets/prepaid card, 30x Playthrough on Bonus and 50x on Free Spins. T&C's apply. New players. £10+ deposit, no e-wallets/prepaid card, T&C's apply. New players only. Min deposit of £10 required. Playthrough applies, additional T&C's apply. The NetBet Vegas Promotion is the same but does not promo code. With this promotion you can again receive up to £200 as a 100% matched bonus. In addition you will also receive 10 free spins to be used on any “Age Of Gods” slots game. Wagering requirements are identical to those in the NetBet Casino welcome package. The NetBet poker promotion is arguably the most generous on any of the NetBet platforms. You can triple your money up to £1300. The offer does not stop there as you will also receive a £20 free cash bonus as well as 3 exclusive entries to “VIP Instant Win” and 2 exclusive entries to “Daily Final. A points scheme is in place and in order to qualify for the full £1300 bonus you must earn points based on raked hands regardless of the amount required to play the pot. There are 3 stages to release your bonus. 3rd Stage – (the next £1390 in bonuses) – everytime you collect another 200 points you release a £2 bonus.